The best way to develop active listening skills is by understanding the various degrees of listening you can engage in, and the results you can expect from each one. Some people ask what's the difference between Active and Reflective Listening. They actually overlap: to be able to reflect or mirror what a speaker says, you need to actively listen. On one hand a reflective listener is an active listener. On the other hand, an active listener is not necessarily reflecting, he could just be Repeating or Paraphrasing. 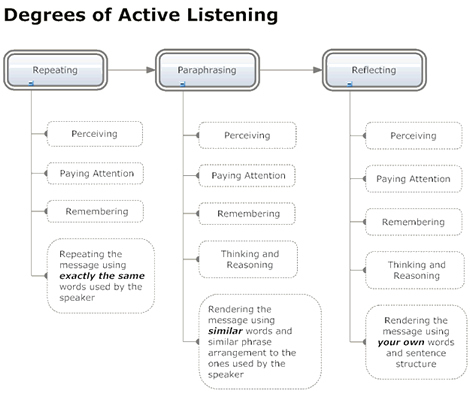 The chart below shows the progression in the quality of listening that an active listener can engage in. As you can see on the chart, Repeating is the most basic way you can listen. You just have to pay attention and remember the words the speaker is using; then repeat the words back to the person. This will seem odd to the speaker, it’s best not to use this technique. The speaker may conclude that you are making a crude attempt at letting him know you're listening to him. Speaker: I've been thinking about applying for the Assistant Director job that just opened up. I am ready to take on more responsibilities, even if it means working longer hours and more office politics. You: You've been thinking about applying for the Assistant Director job that just opened up. You’re ready to take on more responsibilities, even if it means working longer hours and more office politics. Odd... Let's move along to the next level of listening. Paraphrasing involves paying attention, remembering and reasoning what the speaker is telling you. Learning how to paraphrase needs to be the first level of listening that is worth practicing and mastering. The speaker will feel listened to, because you are actually listening to be able to paraphrase back what’s being said. You: Now that the Assistant Director job is open, you are thinking of applying for it. You’re ready for it, despite possible disadvantages of the job. By paraphrasing, you used similar words and phrases to the ones used by the speaker. You rearranged the words and phrases, which required you to listen and understand what the speaker is saying. Reflective Listening is where you actually process the information you hear and summarize it using your own words. Reflecting what the speaker said entails having empathy, withholding judgment and seeing the world from the speaker's point of view. This level of listening leads to deep connection with people. The speaker will feel understood and may feel inspired and willing to understand you too. You: You have mixed feelings about a promotion. You know there is a price to pay for moving up in the organization. In this last example, you listened to the speaker and sensed some possible doubts about the value of being promoted. You reflected those feelings to the speaker summarizing the message in your own words. Can you see the difference between the three levels of active listening? As you set out to become a better listener, skip Repeating, aim to use Paraphrasing as a starting point. Practice Reflective Listening as much as you can, with time it will become the way you listen all the time. This will improve your listening skills, your communication and connection with others.